I am so excited to have Heather from the Crayon Box Chronicles guest posting on Housing A Forest today. Do you ever just stumble on a blog and want to read every single post? Click on the link above and you will be lost among creative ideas and beautiful photos ~ two of my favorite things! I love the Ocean Sensory Pool that Heather is sharing with us today! Ahoy! 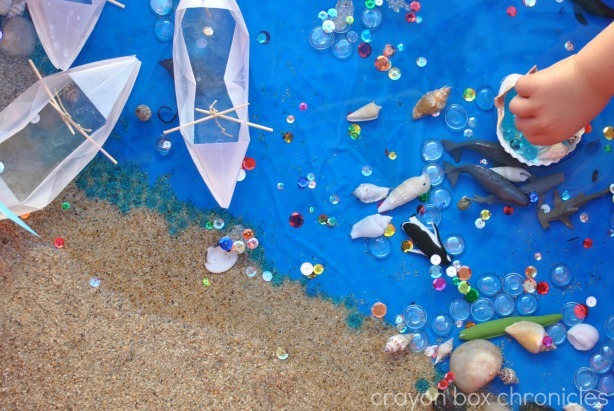 I’m Heather and I explore sensory, art, and messy play at Crayon Box Chronicles! I’m a former window designer and stylist from the Big Apple! I traded my push pins for paint and now I’m a proud mommy to my budding paleontologist — little C! I’m so happy to be here today at Housing A Forest to explore sensory play, origami, and shapes with you! Let’s dive into the Big Blue O together! All aboard! 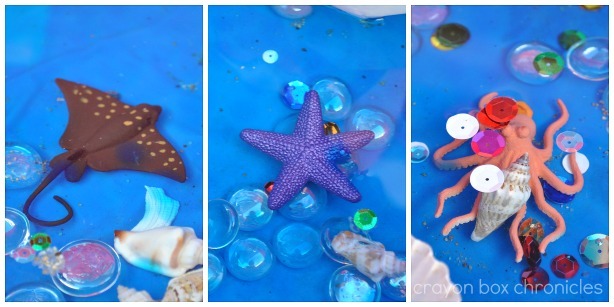 Here’s a sneak peek inside our ocean sensory pool! Let’s get started! 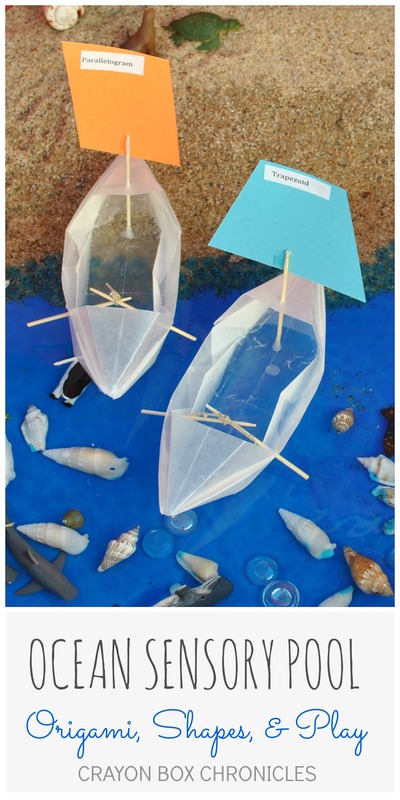 Pull out your wax paper, yes I said wax paper, and let’s make our boats! Wether this is your first time making origami boats or you’re an expert, you’ll find this fold to be a breeze! With a little practice the kids can fold it too! This is a hooded Sampan boat! It floats in water too! Why wax paper? Well, it lasts longer in water than paper, it’s so versatile, and we love using basic household goods for projects! To learn the fold just follow this great tutorial! Cut 12 x 12 sheets using a paper cutter or ruler edge. The paper will cross over at this point (pointer finger), that’s ok, just be consistent on both sides. When you flip the boat over and push the bottom through, hold the sides where my thumb is so the fold doesn’t pop out. 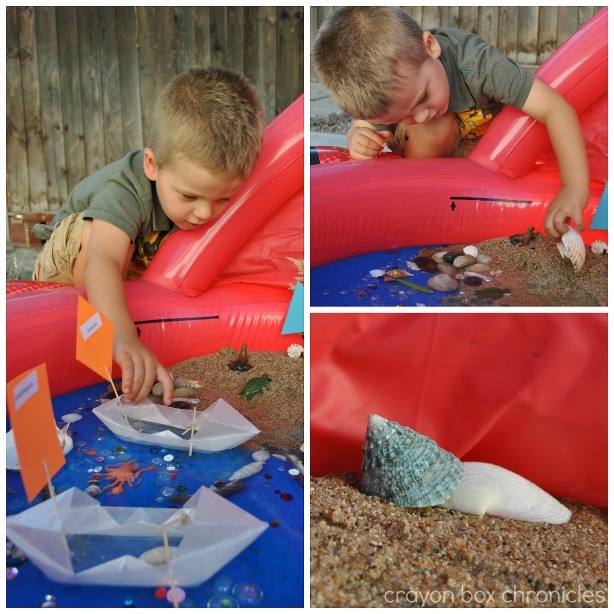 Once your boats are complete, it’s time to make the sails and shape flags! Sail time! Shapes are so fun! I used a hexagon, trapezoid, parallelogram, circle, square, rectangle, right triangle, octagon, diamond, and triangle. I made the shapes in Word and printed them on standard 65 lb. card stock. For an added lesson I added the names on the back of the shapes. Here’s the process: #1 Cut out the shapes. #2 Glue shapes to toothpicks (tips cut-off). #3 Poke a hole in the boat. #4 Add hot glue at the base of the toothpick. I used the remaining shapes as flags! This is totally optional — I added “oars!” Let’s set-up and play! Here’s our finished boats and flags. We added a piece of styrofoam under the flags, a little foliage, and sand. After our shape lesson, C took the flags out of the pool to save them for later. Kids turn — time to explore imaginative and sensory play in our ocean pool! 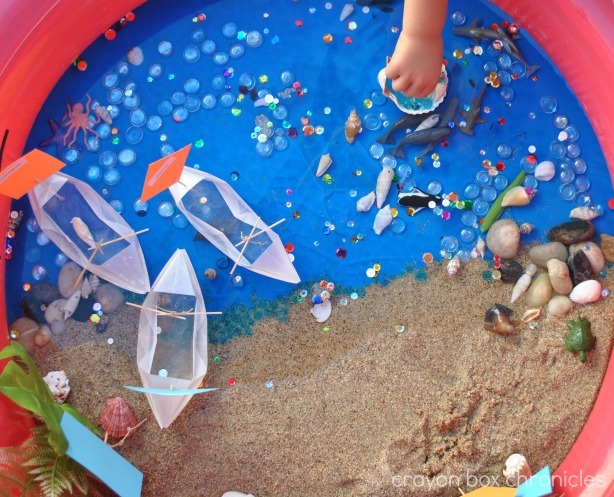 We added water beads, clear gems, rocks, beach shells, miniature ocean creatures, and water to our crab pool! Luckily, we had the crab pool from when he was a baby. Let’s meet our ocean creatures!! Look! It’s our friends string ray, starfish, and 8-legged octopus! They’re so shimmery and colorful! Sea turtle is slowing migrating back to the ocean! Animal fact! Sea turtles spend their entire lives at sea, except when adult females come ashore to lay eggs several times per season every 2 to 5 years. After about sixty days, baby sea turtles, known as hatchlings, emerge from their sandy nests and make their way to the ocean. 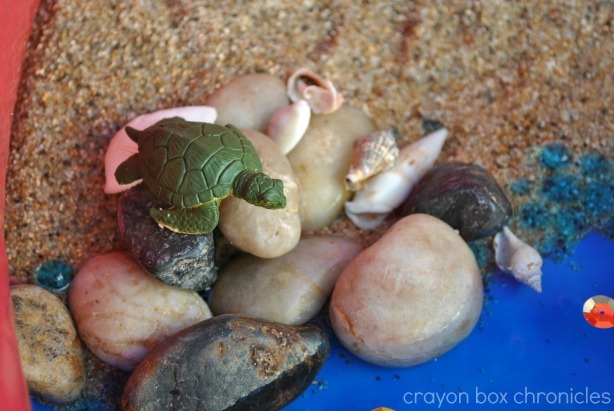 Wow, those are brave little hatchlings! Penguin, look out below! Octopus is searching for his coral reef den! Animal fact! Did you know octopuses have three hearts. Two of the hearts pump blood through two gills, while the third pumps blood through the body — fascinating! Sea shell is taking a ride on the Sampan boat! 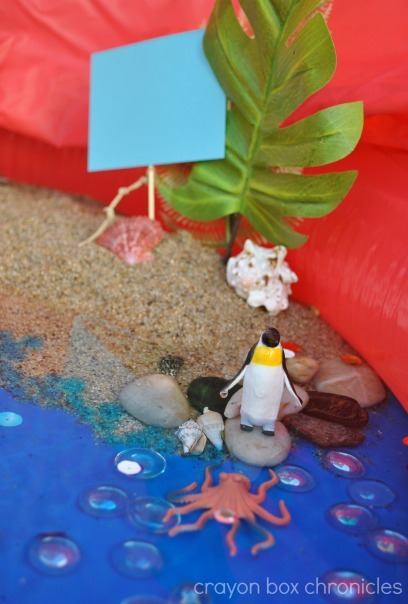 For more origami and ocean fun, check out C’s Under The Sea Birthday Party! There’s lots of DYI tutorials on his party designs. Thank you for joining us in our journey today as we explored play through imagination! (note) Please always supervise your child during play and never leave them unattended, especially around water. I love it Heather, thanks so much for sharing! 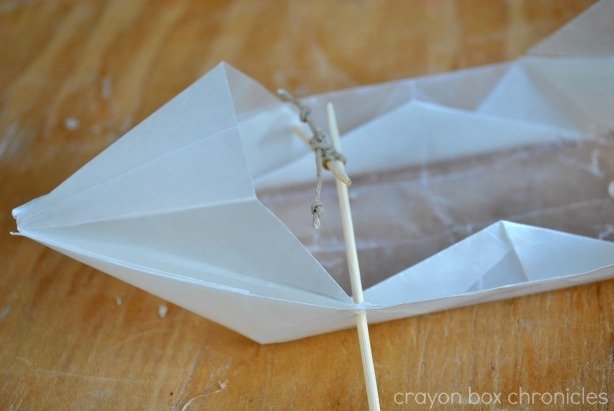 I would never have thought to make a boat out of wax paper, what a brilliant idea! 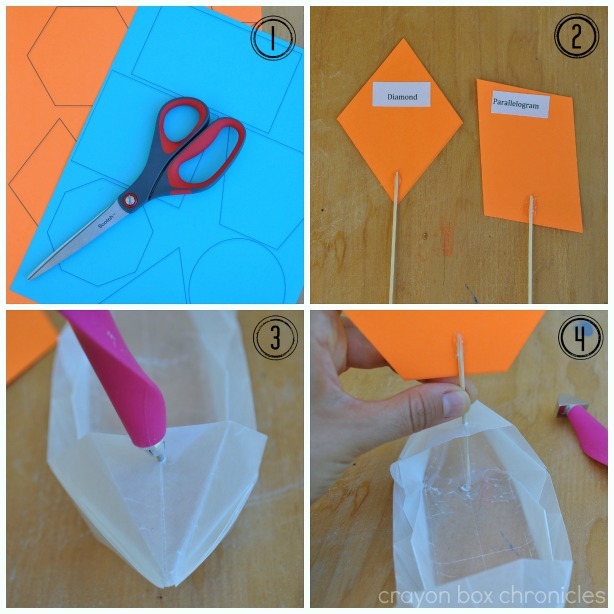 My kids love origami, and they are going to love these! We all love comments, so why not pop over and visit Crayon Box Chronicles and tell her how much you enjoyed her post on Housing A Forest. 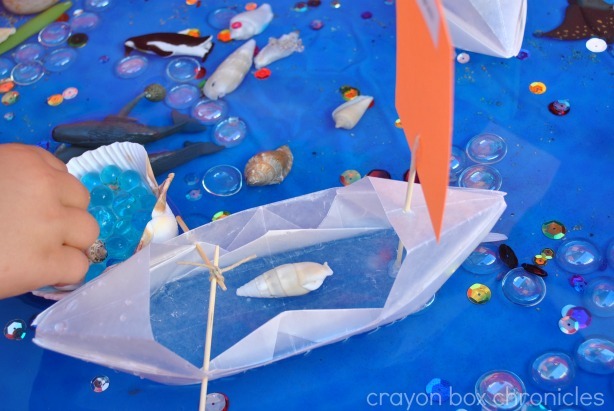 Posted in Kid Projects, Uncategorized and tagged Boats, Guest Post, Math, sensory, Small World. 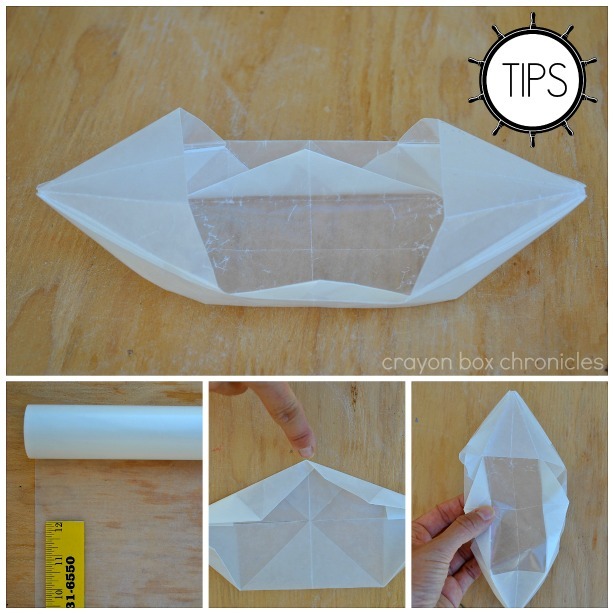 Why didn’t I ever think to use wax paper when making our paper boats?! Love it! Thank you so much for having us over today Tammy! 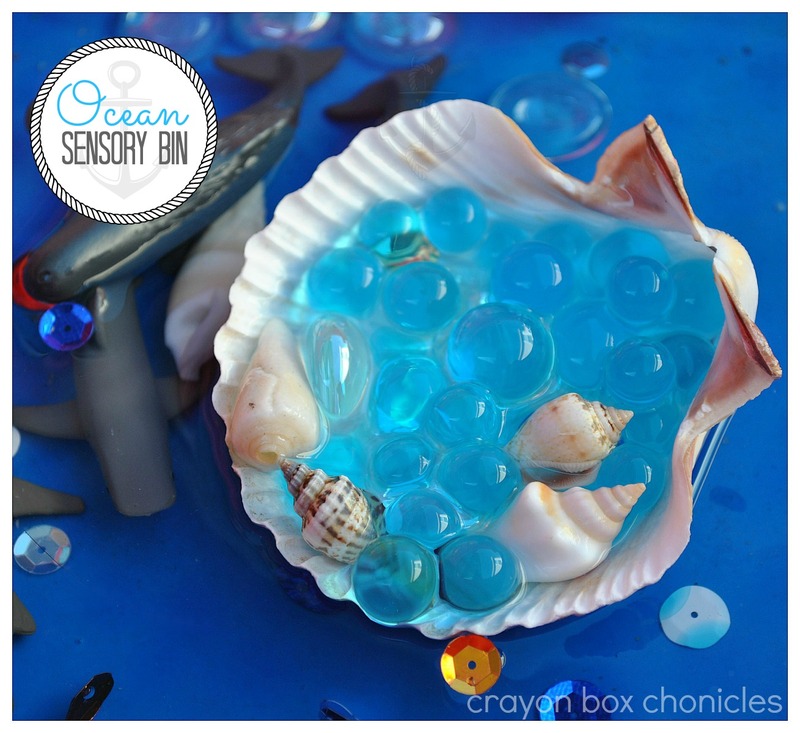 This is an amazing sensory bin. The set-up is enticing and there is so much to explore and learn. Great one! I love this one too! Please come share! What a great way for a child to explore and use their imagination. 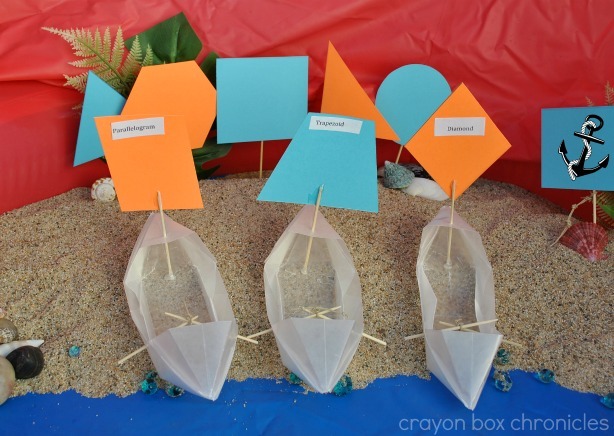 I love the idea of using different shapes for the sails! I have pinned this post. oh those boats are so clever!! !